Another book due for defenestration -- prompting me to read it through one more time for the cheap seats. This is a 1986 paperback reprint with a peculiar cover. Falling apart, it's almost time to go. 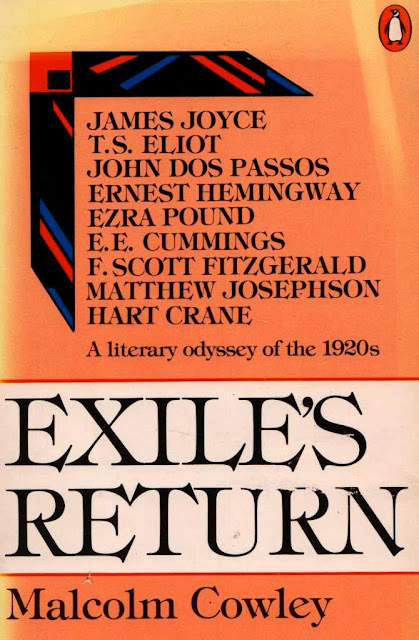 Malcolm Cowley, Exile's Return: A Literary Odyssey of the 1920s (Penguin Books, reprint of the 1956 Viking Press edition; original edition published in 1934). This handy tome follows the arcs of mostly American writer types born around the turn of the twentieth century (1900 +/- 5), as seen through the observations of Malcolm Cowley (1898-1989). The most exciting time for many of this rambling crew came between the Great War of 1914-1918 (volunteering as ambulance drivers, nurses, pilots) and the Great Crash of 1929, followed by a puttering on through the Great Depression and, of those who didn't go crazy, commit suicide or otherwise die in the meantime, proceeding into the 1950s. Snippets: "Paris was a great machine for stimulating the nerves and sharpening the senses. Paintings and music, street noises, shops, flowers markets, modes, fabrics, poems, ideas, everything seemed to lead toward a half-sensual, half-intellectual swoon . . ." (page 135). "It was during one of those Wednesdays in Paris that I was first introduced to the Dada group . . ." (page 135). Cowley became fond of Dadaists, loving their energetic rebelliousness and wild antics. And so: more to come before the drop. Now that's an impressive list of names. I'm rather proud of recognizing them all. Erik-Even I knew a few! And, I WILL get to Paris someday! Cheers, y'all ~! Mark, good points, indeed.